Welcome to Just Ahead’s Death Valley Trip Planner—our guide to everything you need to know to plan your trip to Death Valley National Park. 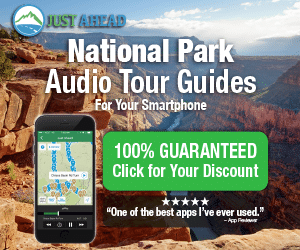 Click here to see the complete series, and be sure to download our Just Ahead smartphone audio tour of Death Valley before you head to the park. Death Valley National Park is a great road-trip destination. It’s not difficult to get to or to drive through, but planning a trip there requires more than just throwing a few things into the car. It’s a remote desert area with long distances between services. Which route should you take? Will you camp or stay in park lodging? What should you pack? Once you’re under way, the Just Ahead app turns your smartphone into a narrated audio tour of the park, and we tell you what you need to know as you drive along. It’s the most pleasurable way possible to visit Death Valley National Park. How Much Time Should I Spend in Death Valley? Before you decide how much time to spend in Death Valley National Park, it’s good to be aware of two things: First, Death Valley is the largest national park in the lower 48 American states (yes, bigger than Yellowstone). Second, Death Valley is remote. That’s a huge part of its appeal. It’s at least 2-1/2 hours from Las Vegas, five hours from Los Angeles, eight hours from San Francisco. It would be a shame to drive such a distance and spend less than a day in such a huge, magnificent park. But we understand that everyone has their own way and their own schedule, so here’s our rundown of what you can do and see in Death Valley in the amount of time you might have. Remember, no matter how much time you have or what approach you take to the park, Just Ahead will guide you every step of the way. We understand that you’ll see some of the park as you approach, and that there are several different approaches, so take these as general guidelines. And remember that the order in which you see things isn’t important. If you’re simply doing a drive-through, you’ll want to beeline to Furnace Creek in the heart of the park—the hub of Death Valley’s road spokes. Spend 45 minutes in the visitor center to get oriented, see the exhibits, perhaps see the park’s film. Drive down to Badwater and experience the lowest place in North America. Turn around at Badwater and take the scenic Artist Drive on the way back up. Then head east on Highway 190 and take in the awesome views from Zabriskie Point and Dante’s View. No matter how much time you have in the park, be sure to check out the salt-pan floor of Death Valley at Badwater. How Do I Prepare for a Trip to Death Valley? Death Valley is the driest place in North America. Even when the temperature is pleasant, even when you’re standing still, the air constantly saps moisture from your body. So dehydration is a year-round concern. The solution is simple, of course—carry and drink plenty of water. Drink regularly, even if you’re not thirsty. You’ll need at least a gallon per person per day—twice that if you’re hiking or biking. Carry water with you whenever you leave the car—I like to use a Camelbak or similar hydration system so that my source of water is just inches away. The main weather concern you should prepare for in Death Valley is, of course, heat. But much of the year it can be cool to chilly in the park at night. Wind is likely anytime. Winter rains and occasional summer thunderstorms can wash out roads. So keep an eye on the weather by way of a website like weather.com, and check the park’s homepage—or if you’re in the park, the visitor center—for weather alerts and road closures. Remember too that Death Valley has mountains where it can be 40 degrees cooler than the desert floor, and where you might encounter snow in winter and spring. By the way, we share some great stories about the weather in the Just Ahead tour of Death Valley. And we’re not averse to a summer visit, even though it’s a bit warm then. Click here for 10 reasons to visit Death Valley in summer. Why it’s important to be well prepared for a trip to Death Valley. How Do I Get to Death Valley? The main park roads in Death Valley are excellent paved roads, so standard two-wheel-drive serves you just fine for seeing its major sights. Many of those sights require short drives on graded dirt roads that are also just fine for passenger cars. Just Ahead always tells you what to expect before you turn off a paved road. As we say in this post, you’ll want to be sure your car is in excellent working order, particularly its cooling system and tires. Be realistic about your car’s ability to travel dirt roads. In addition to the graded dirt roads that are part of the Just Ahead tour of Death Valley, the park has a huge network (785 miles) of remote dirt roads that require a high-clearance vehicle, if not four-wheel drive. Only set off on those roads if you’re experienced, informed, and fully prepared for backcountry travel. The Just Ahead tour doesn’t extend to those remote roads. 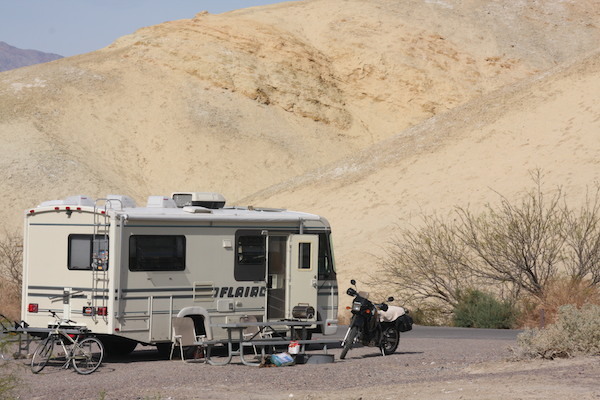 If you do find yourself intrigued by the park’s backcountry roads (Titus Canyon or the Racetrack, for example) visit Farabee’s Jeep Rentals across the street from Furnace Creek Inn. They rent sturdy 4x4s and offer guided off-road tours. Every approach to Death Valley is wild and beautiful. Warning: I’m about to make a case for visiting Death Valley in the summer. But it’s clearly not for everyone. Extreme heat poses serious challenges. It requires constant hydration and maintining elecrolyte levels—i.e., drinking a lot of fluids and eating salty snacks. Ideally, one should only venture outdoors early in the morning and late in the day. Don’t drive or hike into the backcountry. Stay close to your car and to paved roads. If you’re not particularly curious about experiencing temperatures north of 120, I won’t blame you for moving on. There’s plenty more to read on this-here blog. But if you’re wondering why on earth the summer months in Death Valley draw many more visitors than the seemingly sane fall and winter months, read on. I love weather: storm cells, huge snow dumps, massively wet tropical downpours. I’m a native of the Mojave Desert, but I’d never been hotter than a tepid 113 or so. I wanted to know what hot really felt like. So I did what curious writers have been doing for more than a century: I got National Geographic to pay my way on an apparently bizarre adventure. On assignment for National Geographic Adventure magazine, I took on Death Valley in August, and I hit pay dirt: It was really hot. It hit 126 the day I hiked across the salt pan at Badwater, at which time I knew that I had to be the hottest fool on the face of the earth. So what does 126 feel like? Something like a hot blow dryer aimed at your face. Or like when you open the oven to baste a turkey and get that initial searing blast that makes your eyes squint. Only in Death Valley, the sensation lasts. But I just kept hydrated by drawing constantly on my Camelbak lifeline, walked slowly, never ventured too far from the car, and I mean this: I really enjoyed the experience.